We’d love your help. Let us know what’s wrong with this preview of Spiritual Leadership by J. Oswald Sanders. To ask other readers questions about Spiritual Leadership, please sign up. Barbara Have you found Spiritual Leadership by Saunders, yet? I borrowed a copy through my county's library program, Inter Library Loan. Now that I read this…moreHave you found Spiritual Leadership by Saunders, yet? Now that I read this book that was recommended by John C. Maxwell as one of the most influential books he read as a young man, I want to purchase a copy, too. Amazon has the copy I read . . . I liked the extensive updated notes and a great small group study guide. I have heard of this classic previously but have not had the opportunity to read it until now. Having thus finished the book, there were parts of the book that was profitable for me spiritually. Among the thing that convicted me was the chapter on â€œThe Leader and His Timeâ€, particularly this quote: â€œWe have each been entrusted with sufficient time to do the whole will of God and to fill out His perfect plan for our livesâ€ (114). The author Oswald Sanders gave examples of Godly men whose gre I have heard of this classic previously but have not had the opportunity to read it until now. Having thus finished the book, there were parts of the book that was profitable for me spiritually. Among the thing that convicted me was the chapter on â€œThe Leader and His Timeâ€, particularly this quote: â€œWe have each been entrusted with sufficient time to do the whole will of God and to fill out His perfect plan for our livesâ€ (114). The author Oswald Sanders gave examples of Godly men whose greatness also meant that they were disciplined with their time. This is an area I have been grown much in the last few years being in Seminary, yet I also realize that I can still improve in the area of time management. Of course, in order to accomplish this requires self-discipline. As I grow more in the Christian faith, I realize more and more of how Godâ€™s grace in a sanctified Christian is also seen in how the believer has discipline in his or her life. What at first seem like an unlikely area of Christian leadership is also covered in its own chapter: The Leader and his reading. There is a sense where leaders in the natural realm must read, and Sanders makes the point of how much more should those who are leaders of the spiritual realm must be well-read. Christians who doubt this should read some of the benefits of reading that Sanders listed. Sanders also discussed the importance for Christian leaders to be continiously improving their leadership in chapter fourteen. He lists some general areas, and one of the areas that caught my attention was on problem solving. I can work on resolving conflicts better, especially those that seem out of control to me, or something that I have not experienced before. True Christian leadership is also not easy, and in chapter fifteen Sanders discusses about the cost of leading. A point that stuck out to me was how leadership can be a lonely experience (144-145). This was a good point to know prior to being a Pastor. The discussion about criticism and rejection was a great encouragement, since it ministered to my heart knowing that there is an aspect that this is part of the will of God. So much of leadership focuses on the individual who is the leader, but this book managed to balance things out towards the end. For instance, chapter eighteen tackled the topic of leadership and delegation based primarily upon Exodus 18â€™s account of Moses delegating authority to others. Given that â€œit is a mistake to assume more duties than we can adequately and satisfactorily dischargedâ€, the leaderâ€™s role of delegation make sense (171). Chapter 19 of the book reminds leaders that their position will one day be replaced by the next group of leaders, which leaves a sobering note that no leader is truly â€œirreplaceableâ€. This should be a note of encouragement, knowing that God can raise the next generationâ€™s leadership, but that also means Christian leaders should already be involved in reproducing the next leaders. Chapter Twenty discusses about that, of how leaders are produced through discipleship and not mass production (184). An excellent book on principles that every Christian should strive for, not just those wanting to be leaders. Christians will always be held to a higher standard whether we like it or not, because we represent all Christians in our actions. So if you're looking for guidance as a Christian, searching for an answer, or even just entertaining the idea of being a leader, this book will help. Sanders gives each chapter a clear cut quality and how to obtain it and what to look for. No excessive preach An excellent book on principles that every Christian should strive for, not just those wanting to be leaders. Christians will always be held to a higher standard whether we like it or not, because we represent all Christians in our actions. So if you're looking for guidance as a Christian, searching for an answer, or even just entertaining the idea of being a leader, this book will help. Sanders gives each chapter a clear cut quality and how to obtain it and what to look for. No excessive preaching or chapters overladen so heavily with verse that you'd be better off reading the bible in this book. It also gives questions at the end of each chapter for reflection. I found myself highlighting and underlining passages every other page. I found the insights into leadership and the essential qualities of leadership particularly helpful. I can't say enough how much I enjoyed this book. It was well written and easy to understand. It held my attention throughout the entire thing, and really made you think twice about flippantly deciding on this course. It showed the ups and downs and displayed in depth and in great detail, how Jesus was the best leader because he was the biggest servant. Self-sacrifice is a big part of leadership and Sanders does nothing to diminish this important concept. I highly encourage all Christians to read this book. First of all, this book isn't horrible because the things it says aren't true. I think that the things in here are generally ok in terms of what's said - it's a collection of 1-2 page "observations" or "meditations" on small leadership principles. If you're looking for a sort of devotional book or a vague book about how to apply some generally true (regardless of religious affiliation) ideas with biblical language behind them, this book is fine. But it's precisely that vagueness that kills me. It First of all, this book isn't horrible because the things it says aren't true. I think that the things in here are generally ok in terms of what's said - it's a collection of 1-2 page "observations" or "meditations" on small leadership principles. If you're looking for a sort of devotional book or a vague book about how to apply some generally true (regardless of religious affiliation) ideas with biblical language behind them, this book is fine. But it's precisely that vagueness that kills me. It takes pieces of scripture and simply uses them to arrive at a predetermined conclusion. The context or setting of that scripture is irrelevant. There's no attempt to put the scriptures in their original context. No attempt to try and bridge the gap between an ancient near Eastern culture and a modern or post-modern American one. It's the worst kind of biblical study - the kind that just uses the bible to support what we already think of. I think a lot of us do it, but it's not something we should do. This little devotional book is full of gems that sparkle, catch God’s light and cause one to reevaluate one’s attitude toward spiritual leadership in general and church leadership in specific. It isn’t deep, scholarly, or philosophical, but it is practical and inspiring. Two matters which really jumped out at me were, of course, areas where I was predisposed to resonate with Sanders. I believe in the value of study and I think the biblical character named Nehemiah is a phenomenal model for good This little devotional book is full of gems that sparkle, catch God’s light and cause one to reevaluate one’s attitude toward spiritual leadership in general and church leadership in specific. It isn’t deep, scholarly, or philosophical, but it is practical and inspiring. Two matters which really jumped out at me were, of course, areas where I was predisposed to resonate with Sanders. I believe in the value of study and I think the biblical character named Nehemiah is a phenomenal model for good leadership—better in many ways than Moses or David, though those two paradigms had their own strengths (and weaknesses) during a particular time in the history of God’s people. Since I have already used Nehemiah as a model for leadership on numerous occasions, I was amazed at the new insights suggested by Chambers. So, let me just start by sharing about Nehemiah. Sanders begins by noting (as does almost everyone) the importance of prayer in Nehemiah’s daily schedule, citing Nehemiah 1:4, 6; 2:4; 4:4, 9; 5:19; 6:14; 13:14, 22, 29). He follows up by complimenting Nehemiah’s courage in the face of danger (Nehemiah 6:11) and shared how the confidence of Nehemiah would have spread to the people. Finally, he spoke of Nehemiah’s genuine concern for the people instead of focus on keeping his job (Nehemiah 2:10, as well as his fasting 1:4-6 and intercession 1:6). When I use Nehemiah as a model, I talk about planning/organization, but Sanders uses the same verse (Nehemiah 2:8) to speak of foresight-planning by any other name. Nehemiah’s waiting three days in Jerusalem before doing anything (Nehemiah 2:11) was listed as caution. I particularly liked the observation on Nehemiah’s empathy (Nehemiah 4:10-12; 5:1-5), a point I had never emphasized. I did like the idea that Nehemiah was impartial (5:7) and a realist (4:9). Sanders really began to get my attention when, instead of the one verse I continually used to talk about Nehemiah’s role in raising morale, he cited four different mottos, prayers, or praise songs that Nehemiah used (2:20; 4:14; 4:20; and 8:10). Lest one think that this book on leadership is one-dimensional—strictly providing biblical insights without examining leadership in the secular world—one should think again. I particularly liked a quotation from a former Chinese leader, Li Hung Chang. Chang said, “There are only three kinds of people in the world—those that are movable, those that are immovable, and those that move them.” (pp. 19-20) Dr. Sanders also cited an influential person who read prolifically and was asked how he managed to get time to do so. I liked the answer: “I don’t get time for it. I take it.” (p. 93). I also liked his citation of Christian author Muriel Ormrod who said, “We should always aim to read something different—not only the writers with whom we agree, but those with whom we are ready to do battle.” (p. 100) He even contends that books require three readings: 1) without losing continuity, 2) carefully thinking about each point, and 3) annotating the book in the back of the book (p. 103). I like the idea of the three readings, but I rarely get uninterrupted reading time, so I tend to annotate as I go along. I particularly liked his very practical (and unexpected in a Christian fundamentalist book) word about failure. “The successful leader is a man who has learned that no failure need be final, and acts on that belief, whether the failure is his own or that of another.” (p. 125). Even more unexpectedly in a fundamentalist book was a quotation about depression (after all, how can anyone be depressed if they are filled with the presence of the God of all joy?). He cites Charles Haddon Spurgeon as saying, “Before any great achievement, some measure of depression is very usual…” (p. 149). I especially liked the irreverent summary of this idea from one Samuel Chadwick, “If successful, don’t crow; if defeated, don’t croak.” (p. 150) All of these are very useful teachings about leadership that aren’t often covered in ministerial handbooks. I’m glad I found this little devotional work in a pile of books that a friend was removing from his library. It’s going to stay in mine for a while. One of my favorite books of the year I’ve read! As I’m training to be a missionary this book was a capsulized version of every missionary leadership quality I’ve been taught elsewhere, so wise and helpful. Biggest part that I love is how practical and spiritual it is, the emphasis on missions is wonderful and finally pushing being a servant and not just a manager when you lead. A leadership classic. I had never read it before, and it is fantastic. Anyone in ministry or business leadership would benefit from this book. This was one of the most helpful and insightful reads on leadership I've found to date! I LOVE THIS BOOK~ This book is an excellent resource for leadership. Every serious Christian should read this. This was a library book. But I am going to buy it. Although this isn’t a long read some how it took me quite a while to work through. But, I do think that is the way this book is supposed to be read. It is broken down into devotional style meditations on scripture, some of them mediocre, some pure gold. In my opinion the very best few chapters came near the end of the book. For anyone who has done other reading on Christian leadership many of the concepts covered will not be new. Things such as having a servants heart, being filled with the Spir Although this isn’t a long read some how it took me quite a while to work through. But, I do think that is the way this book is supposed to be read. It is broken down into devotional style meditations on scripture, some of them mediocre, some pure gold. In my opinion the very best few chapters came near the end of the book. For anyone who has done other reading on Christian leadership many of the concepts covered will not be new. Things such as having a servants heart, being filled with the Spirit, delighting responsibilities and empowering others, maintaining personal character ect. However, I think one of the distinctive features of this book is the intensity of Christian leadership. As Sanders says in the final word, it is easy to feel overwhelming by the call to leadership, but that is because if it was easy everybody would be doing it. At times Sanders can come across as legalistic, and perhaps he is, but the call to a high standards that he brings is something I need to eat repeatedly and often stirred my soul. 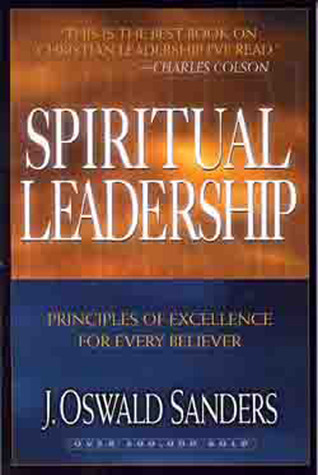 "Spiritual Leadership" was recommended to me by a friend in Christian ministry. It presents a series of speeches given by J. Oswald Sanders on the topic of leadership from a Christian perspective. Though I am not a minister, I found the book to be challenging and engaging. At the end of each chapter, there are a few questions that help you to reflect on what you just read and apply it to your own life. This is the kind of book that needs to be read slowly, preferably not more than 1 chapter a da "Spiritual Leadership" was recommended to me by a friend in Christian ministry. It presents a series of speeches given by J. Oswald Sanders on the topic of leadership from a Christian perspective. Though I am not a minister, I found the book to be challenging and engaging. At the end of each chapter, there are a few questions that help you to reflect on what you just read and apply it to your own life. This is the kind of book that needs to be read slowly, preferably not more than 1 chapter a day, as the topics within each chapter are quite varied and require personal reflection in order to get the most benefit out of them. I imagine I will come back and reread this book again someday, as there are plenty of things I am sure I have already forgotten. Spiritual leadership is one of the best books I have ever read on Christian leadership. This book is special to me because it draws its guiding principles and precepts from the Holy Bible; not from worldly standards. The vital scriptural values and convictions it puts forward can make a true spiritual leader out of anyone who is willing. The author xrays the life of great christian leaders, showing the aspiring leader that it is possible to be great by following after the steps of the great (Heb Spiritual leadership is one of the best books I have ever read on Christian leadership. This book is special to me because it draws its guiding principles and precepts from the Holy Bible; not from worldly standards. The vital scriptural values and convictions it puts forward can make a true spiritual leader out of anyone who is willing. The author xrays the life of great christian leaders, showing the aspiring leader that it is possible to be great by following after the steps of the great (Hebrews 6:12). This classic further pinpoints the goal of christian living, which is missions and soul-winning; it does this by revealing the passion and motivations of great christian leaders of the past; men and women who invested their lives for the cause of Jesus Christ and his Kingdom. We must therefore in this age be focused on what has always made the great leaders of the past out of ordinary men and women- a heart for God and the expansion of his kingdom. Less successful as a book than as a patchwork of aphorisms, quotations, nuggets of wisdom, anecdotes, and whatnot. Came from a series of addresses, and indeed reads as such. Sometimes Sanders' use of the biblical text is rather arbitrary and decontextualised, but his heart is definitely in the right place. It was out of date when it was written back in the 60s, but that is as much a strength as a weakness - whatever is in date is about to go off, anyhow. One can find any number of fashionable bo Less successful as a book than as a patchwork of aphorisms, quotations, nuggets of wisdom, anecdotes, and whatnot. Came from a series of addresses, and indeed reads as such. Sometimes Sanders' use of the biblical text is rather arbitrary and decontextualised, but his heart is definitely in the right place. It was out of date when it was written back in the 60s, but that is as much a strength as a weakness - whatever is in date is about to go off, anyhow. One can find any number of fashionable books about "leadership" or character, and books that jar somewhat have the potential to be more illuminating and genuinely challenging. Spiritual Leadership is powerful, deep and densely compacted with substance. I take notes when listening and this book had me stopped every few seconds writing notes. Having read or listened to 50 books in the past six months, this is one of the top 5. Will be listening to this again, worth re-reading every year in my opinion. There are a multitude of applications for spiritual leadership. The wisdom in this book will benefit anyone involved in ministry of any capacity. The material is also rele Spiritual Leadership is powerful, deep and densely compacted with substance. I take notes when listening and this book had me stopped every few seconds writing notes. Having read or listened to 50 books in the past six months, this is one of the top 5. Will be listening to this again, worth re-reading every year in my opinion. There are a multitude of applications for spiritual leadership. The wisdom in this book will benefit anyone involved in ministry of any capacity. The material is also relevant to workplace leadership and behavior. All the chapters are short and sweet. This is a good introduction and overview of the differences between a leader in the eyes of the world and a leader in the eyes of God. Each chapter is a brief mediation on a passage of scripture that has profound implications on leadership. It is a clear, easy to read and pretty straightforward book. It could be a useful tool for discipling young people in leadership and in many areas they may have not considered. Insightful and helpful book which describes characteristics of spiritual leaders with a lot of Scripture references to cast strong vision for leading God's people. Just over halfway through, I had difficulty finishing as chapters grew longer and I began to wonder whether any could aspire to such lofty standards pulled from all Scripture. I finished the book, by the grace of God with which I rely upon while leading others! This is a book to be invested in. Not only in long, focused, hours of study and attention, but also in spiritual and emotional attentiveness. It is rich in wisdom and deeply challenging. If heeded, it will revolutionize your influence on those around you and on yourself. Everyone is a leader because everyone has influence. Therefore, everyone should read this book. Excellent book on leadership. It's most applicable to ministry or church contexts but would be helpful to any Christian in any position of leadership. I most appreciated Sanders' working through the qualifications for leadership found in the Pauline epistles. This book was challenging, convicting, and encouraging. This was a very good book. At the end of the day, spiritual leadership is all about serving others. This book explores how that plays itself out in many categories, including my motives, during prayer, obstacles faced as a leader, and how to delegate and train others to lead. Produced some good discussion in our small group. This is a great read on spiritual leadership. I enjoyed the theological/philosophical angles Sanders uses throughout. It's a little scattered, which makes it hard to digest the book as a whole, and gain clear/actionable application to life. Over all, though, I will re-reading this many times and plan to lead a small group on it. Definitely recommend! This is a great book for anyone in the church, not just "official" leaders. It was recommended to me as women's small group leader. I pray that I will reread it again and really practice these principles in all areas of my life.